There are 100s of social media channels out there. Wikipedia currently lists 200+ channels (with a disclaimer saying, ‘This list is not exhaustive, and is limited to notable, well-known sites’). And there are new ones springing up all over the globe each month encouraged by the phenomenal success of Facebook, Twitter, WhatsApp and Instagram. With so many options, how do you choose the right set of social media channels for your ministry? As a church, you have limited resources and time, so it is important that you invest in the right channels that will give you maximum results and help you achieve your ministry goals. Here is a list of 5 questions to help you make that choice. 1. Trends: What are the current trends in social media? Do you know which are the top social media channels right now? Do you know how they work and their latest features? Knowing the latest trends, changes in consumer behaviour and the latest features can help you select the right social media channels. For example: In June 2018, Instagram announced a feature in which you can add music to your Instagram Stories (which is a popular form of content on the platform). If you are in music ministry, knowing this information can help you decide if this is the right channel for you. 2. Audience: Which channels does your audience spend time on? “Fish where the fish are” is an old, but relevant saying that is applicable to social media. Know where your target audience are and how they spend their time online. Then plan and focus your efforts there. Sometimes you will be surprised that the popular channels may not be the ones where your target audience hangout. 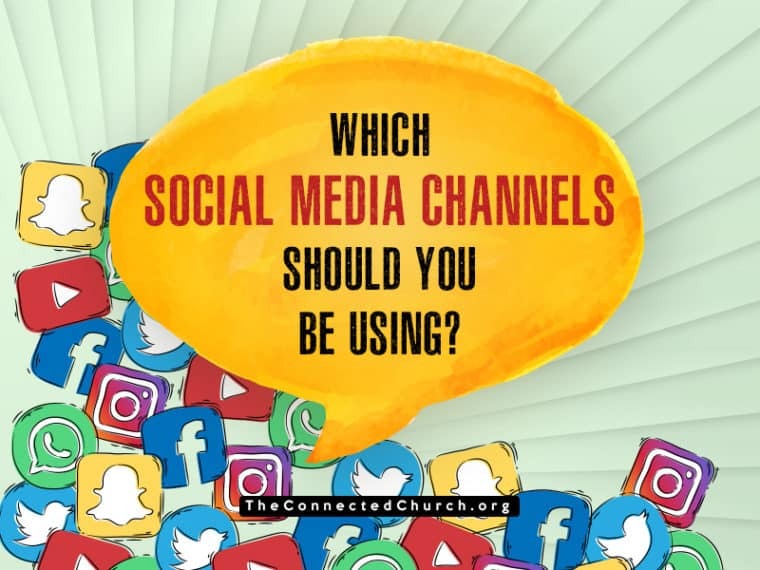 For example: If you are in youth ministry, and you target younger audience, you may find that channels like YouTube, Snapchat or Instagram works better for you than Facebook, even though Facebook is a much more popular platform. 3. Content: What type of content does your audience like? What type are you planning to produce? Select your social media channel based on the type of content that your audience likes and the type of content that you are willing to or capable of producing. Each social media channel has a unique character that defines the type of content that works well on it. For example: If you are a ministry that is comfortable and capable of producing more videos, then you could focus on YouTube and Facebook, and use other channels to promote your YouTube & Facebook content. 4. Goals: What do you want to accomplish using social media? What is the end goal of your social media marketing efforts? Listing down your end goals will help you get clarity on the type of social media channels that you should be using. Certain type of social media channels have the capacity to deliver certain types of results. For example: Both YouTube and Facebook are good for videos. But if your goal is to promote your ministry to a specific target audience, get them to watch a shorter videos and take quick actions (like donating) using tools like messenger chatbots, then Facebook might work better for you than YouTube. But if you have a longer format of video and want to build a community of potential donors who you like to nurture in the long term, then YouTube might work better for that specific objective than Facebook. Having clarity in goals and objectives can help you get clarity on choosing the right channels. 5. Process: Does the social media channel’s required workflow fit into your ministry’s workflow? Content marketing works best when you are consistent in your posting and engagement. To be consistent and to sustain certain level of activity in social media channels, workflow-based internal planning is very crucial. Every social media channel has its own character and style of functioning. Careful planning is required to fit the specific requirement of the social media channel with your everyday business workflow. For example: Instagram requires you to post 5 to 6 times a week, using content that has good designs and attention-grabbing photos & videos in order to get high engagement levels. How can you make this happen with your current ministry team? Will this fit into your everyday operations? Do you have the resources to do this? If your answers to these practical questions are clear, then you can choose this channel as one of your channels. Leave a comment below if you have any further thoughts, questions, suggestions or comments on the topic of choosing the right social media channel.